Once you understand how the five key flavors (sweet, salty, sour, bitter and spicy) work together in Thai cooking, you can create authentic dishes that pack a powerful punch. Thai cooking is an art form. The key to perfecting the dishes is attaining a delicate balance of flavors, which only comes after years of practice and tasting. You need to understand each ingredient and marry them together. 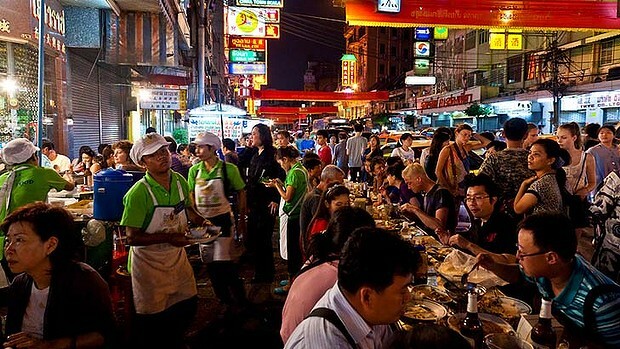 Once you achieve this, your food is guaranteed to transport you to the hawker stalls in a sunny Bangkok street market. This garlicky stir-fried broccoli and bok choy dish is easy to toss together. 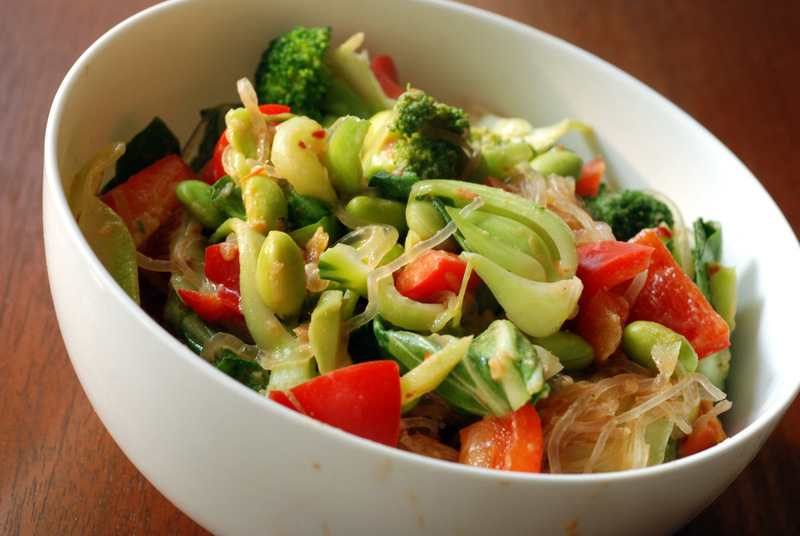 You can use other vegetables such as baby corn or Chinese cabbage as well. Heat the oil in a wok, add the chopped garlic and sauté well for about 30 seconds, until light golden. Add the chili paste and yellow bean paste and sauté further for 1 minute. Add 2 tbsp water. Stir in the blanched broccoli florets, bok choy and sugar and sauté for about 3 minutes until everything is well combined and the broccoli is cooked. Add the basil leaves, season with chili vinegar and serve hot with steamed jasmine rice. Making your own curry paste is what elevates the flavors of this Thai curry. The combination of fragrant spices with sweet coconut and chicken makes this curry a popular favorite. 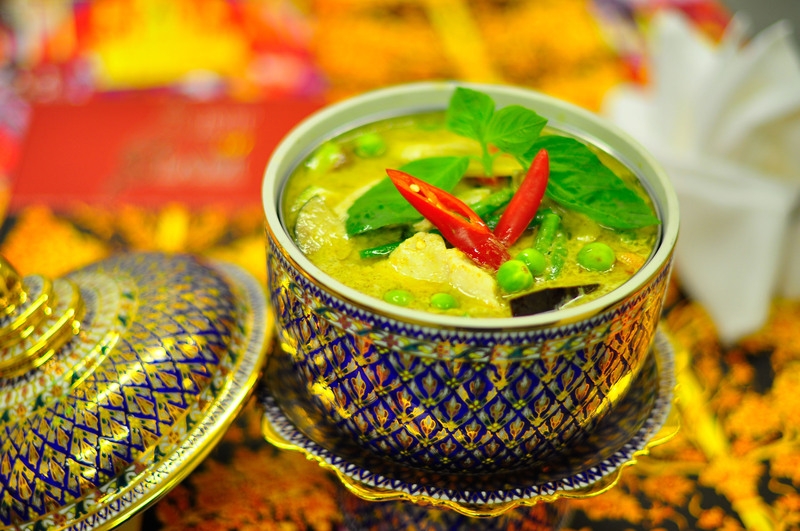 This recipe is from the south of Thailand so it’s not as potent, and relies heavily on coconut milk. The trick is to add the thick extract of the coconut milk at the end so that the curry doesn’t curdle. To make the paste, pound all the ingredients together in a mortar (or blend in a mixer-grinder) until fine. Add 1-2 tbsp of water, if required. Heat the oil in a deep-bottomed pan and add green curry paste. Sauté on a low flame. Add the second, thinner extract of the coconut milk and stir until it releases its oil, for about 3 minutes. Add the sugar and then cook for 2 minutes. Add the kaffir lime leaves, pea aubergines, bird’s eye chilies and coriander root paste. Stir in the first, thicker extract of the coconut milk and simmer on a low flame for 10 minutes. Once the curry is ready, add the chicken. Add more sugar or fish sauce, if required. Heat for about 3-5 minutes, until the chicken is properly cooked. Add the basil leaves and fish sauce. Garnish with a drizzle of coconut milk and serve hot with jasmine rice.